Shopping on Black Friday made me feel old this year. The progressively earlier store openings for the “Black Friday” bonanza of shopping has apparently lent itself to a whole new group of shoppers. Instead of the traditional early birds setting their alarms clocks for 3AM Friday and trudging to the stores half asleep, younger night owls are increasingly appearing, hopped up on coffee and seemingly eager to do “something” after Thanksgiving dinner. While the Black Friday Weekend* insights released by the National Retail Federation (conducted by BIGinsight™) don’t include the tweenagers with which we shared the stores this year, it’s still interesting to take a look at some of shopper shifts among the 18+ age groups that we’re witnessing with the age-old Black Friday shopping tradition. Younger Crowds Own the Thanksgiving Shopping Trend. Among Black Friday Weekend shoppers who checked out the deals on Thanksgiving Day (in-store or online), the percentage of 18-34 year olds increased a whopping 30% over a year ago. That compares to just an 8% rise among those 35 to 54 and 9% with the 55 and over crowd. So, while we know that shopping on Turkey Day is a rising trend, it’s clearly one driven by a younger demographic. Merry Christmas to Me. Yes Virginia – this is the season of giving – but with doorbuster deals like $8 dollar coffee pots, who can resist the one-for-you, one-for-me mantra? Practical consumers are increasingly embracing the idea of “self-gifting” at the holidays, buying items for themselves at discounts typically not seen throughout the rest of the year. And these self-centric Santas were certainly out en masse last weekend: eight out of ten Black Friday Weekend shoppers reported that they had taken advantage of retailers’ online and in-store promotions to buy non-gift items. This figure rose to 86% among 18 to 34 year olds, while those 35 to 54 (81%) and 55+ (72%) showed more restraint [well, kind of]. 18-34 Year Olds Found Deals via Friendlier Outlets. There’s something that screams “tradition” to a Black Friday bargain hunter when that 20 pound newspaper – chock full of those delicious retailer ads – lands on the front porch on Thanksgiving morning…am I right? Surprising as it may seem in the digital age, the majority of consumers (50%) looked to advertising circulars as their source for Black Friday Weekend sales, discounts, and promotions this year, followed by retailer emails (36%), online searches (30%), retailers’ websites (23%), and TV advertising (also 23%). Talk to an 18 to 34 year old, though, and you’ll get a different picture. While these youngsters still gobbled up the deals via ad circulars (39%), they were nearly twice as likely to find a friendly discount via Facebook (31%) compared to the general Black Friday Weekend shopping population (16%). Additionally, 18 to 34 year olds were more likely to learn about promotions directly from family and friends (30%), eclipsing those who sought out TV advertising (26%). With the U.S. economy on unsteady ground for the past several years, have consumers just given up on a full recovery? We talk about terms like the “new normal” and wonder if the uncertain economy is just now a part of life. But consumers can’t live their lives mired in the doldrums; we seem to be gravitating toward outlets that give us freedom to laugh, enjoy life, and let us forget the everyday “norm.” It’s called escapism. For some, it’s following all things Kardashian, striking up a dialogue on the latest Here Comes Honey Boo Boo exploits, or waiting in line for the new Apple iPhone 5. For many of us – 7 in 10 to be exact – it’ll mean celebrating Halloween this year. 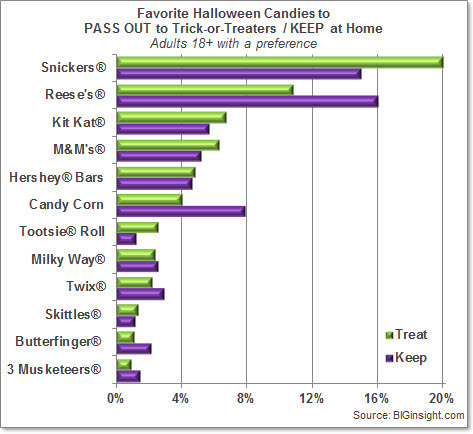 For the past ten years, BIGinsight has been a proud provider of Halloween insights for the National Retail Federation, and this year, we found that 170 million adults will be partaking in the festivities, a new record. Whether it’s attending a party, passing out candy, or even getting Fido in on the act, consumers seem bound and determined to release that pent-up demand for having some fun despite everyday uncertainties. And of the $8 billion dollars consumers are expected to spend on the holiday, nearly $3 billion will be scared up for costumes – and some of this year’s favorites are shown below in the NRF’s Halloween 2012 infographic.